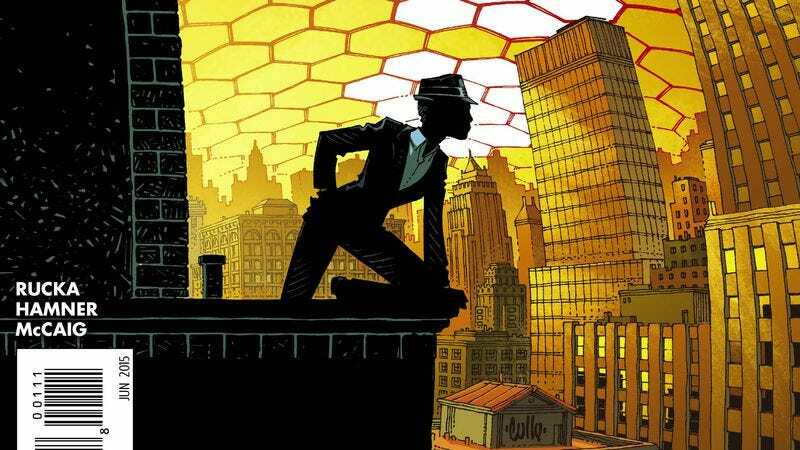 Renee Montoya was one of the most intriguing characters of the pre-New 52 DC Universe, an out lesbian, recovering alcoholic, and former detective that eventually became the faceless vigilante The Question. Montoya was wiped out of continuity after Flashpoint, but she finally makes her return in next week’s Convergence: The Question, which also sees Greg Rucka, the writer behind most of Renee’s evolution, coming back to the publisher after years away. This noteworthy reunion makes The Question one of the most highly anticipated Convergence miniseries, and while this preview primarily spotlights Two-Face, a major character from Montoya’s past, she makes an appearance on the final page looking like the no-nonsense badass she is. Artist Cully Hamner drew Montoya’s back-up stories in Rucka’s Batwoman series, so he’s a great choice for this miniseries. From the densely detailed urban environment to the powerful action staging, Hamner’s art draws the reader into the story, and Dave McCaig’s colors add dimension while accentuating the tone of each page. The book looks fantastic, and given Rucka’s track record, the story will likely be just as impressive. Montoya will be returning to the DC Universe in July’s Detective Comics #41, but The Question looks to be a strong appetizer.